Pizza Pizza has a promise that its customers will get their food “in 20 minutes or less.” However, Nadisha Mendes got something a little more than just the after midnight pizza she and her sister wanted on Nov. 10. Mendes said she’s used to fast deliveries, usually calling Customer Service to ensure the order has gone through. The restaurant promises that its customers will have a free pizza if it takes more than 40 minutes to get their food. The delivery driver, she said, was four minutes later after the cutoff. She called customer service and had him speak with the customer service department. They told him the pizza is free. 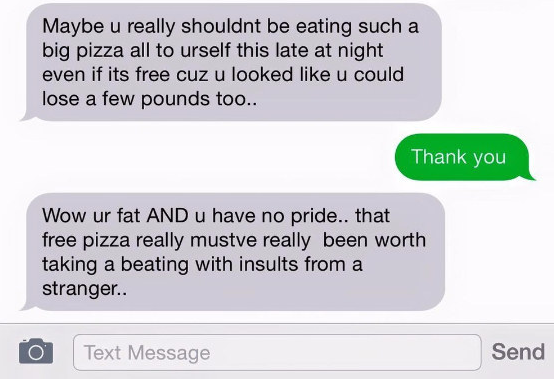 After getting their free pizza, the women received a barrage of messages from the delivery driver about how she strategized to get the free pizza. He told her maybe she needed to spend time learning how to pick up the cell phone instead of plotting how to get free pizza. He told her that she was cheating small businesses who are trying to make a living wage. 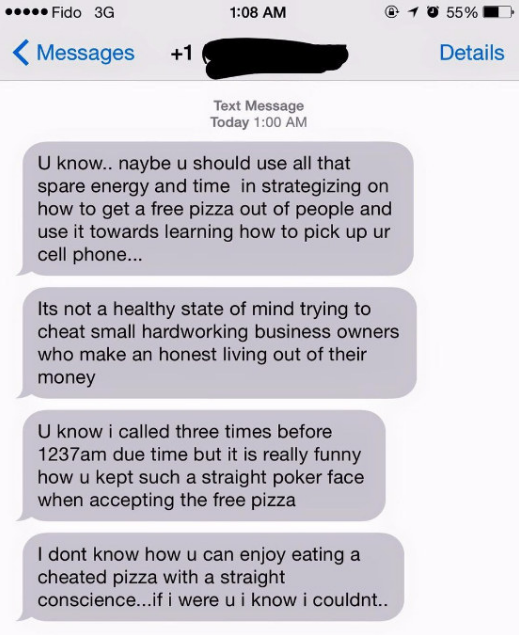 The driver said he had called her three times before the due time, and she lied to entire time to get free pizza. He also went on to insult, saying she could lose some weight. The delivery driver said the Mendes had no pride in herself. After the ordeal, Mendes said she felt attacked. She said she would have paid for the pizza, but this was a total breach of trust. Sakti Hasna, district sales manager for Pizza Pizza, said the pizza delivery driver was new but no longer employed with the company. He also said he was a good guy who made a terrible decision. Mendes didn’t buy that, saying good guys don’t do stuff like that. She canceled her account with Pizza Pizza and is still concerned about possible retaliation from the driver.